Updated: Thursday, June 7, 2018, 8:30 p.m. EDT: In addition to Russell Berger’s firing, the CrossFit location that he praised for canceling an event coinciding with Indy Pride has been shut down. Google lists the business as being permanently closed. I know we are used to white men with white privilege getting away with their fuckery for the most part, but every now and again, one of them gets their comeuppance, and it is super sweet to behold. On those days we rejoice, because the universe gives us just a little bit for our long-suffering. Meet Russell Berger, a Christian conservative from Alabama who up until Wednesday was the chief knowledge officer for CrossFit. 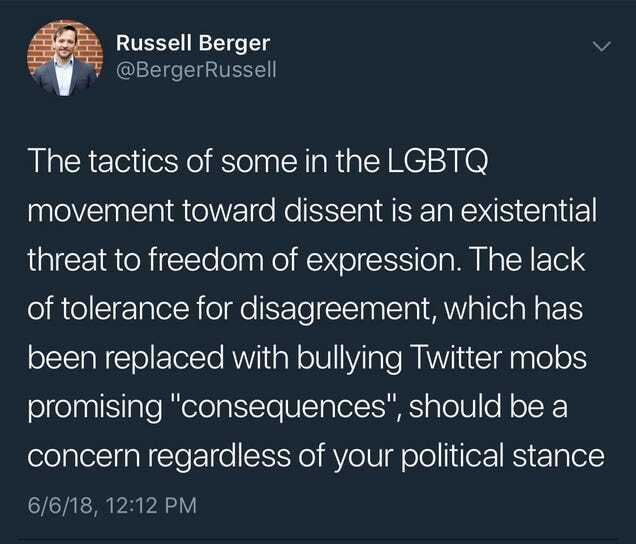 Russell does not agree with the “gay lifestyle.” He believes that celebrating gay pride “is a sin” and that the “LGBTQ movement” lacks tolerance—and is “an existential threat to freedom of expression.” He feels so strongly about this that he took to Twitter to make these pronouncements in a series of now-deleted tweets. Berger’s comments were in response to an announcement from CrossFit Infiltrate in Indianapolis that gym ownership had canceled an event coinciding with Indy Pride. When others questioned Berger about his stance and comments, he doubled down on them. Literally. While the Twitter mobs likely drew attention to the tweets and made CrossFit corporate aware of them, his employer could also have fired him because of the position those tweets put it in from a legal standpoint. Can you say “hostile work environment”? I knew you could. As a Christian, I believe everyone, myself included, is guilty of breaking our moral obligations to God and deserves punishment. But by turning from our sin and trusting fully in Jesus Christ, we can be forgiven and reconciled to our creator. I love those who the LGBTQ community represents, and want them to know Christ, and reveling in sin is a heartbreaking obstacle to that. I use the word ‘sin’ to describe pride events, and the sexual lifestyles associated with them, because that’s what God’s Word calls it, and I believe that God’s Word is true. [T]he same theology that leads me to this view leads me to the knowledge that all humans are created in God’s image, and are therefore inherently valuable and deserve to hear this offer of God’s grace. From the Christian perspective, the most hateful thing I could do for someone would be to lie to him or her about sin and our need for Christ, as unpopular as this may be in our culture today.